Some people wonder all their lives if they've made a difference. The Marines don't have that problem. Number One Son is now a United States Marine. After 13 weeks of only communicating with him via letters, on March 4 we finally saw and spent time with Number One Son. March 4 was Parent's Day at Parris Island. It started by arriving at the Parade Deck at 7:00 AM to watch the start of the Motivational Run. At that hour, all of the recruits looked pretty much the same, however we saw his platoon. After performing some warm up exercises, the recruits left the Parade Deck for their run. We saw his platoon run by and, somehow, I found him. Yelled out his name, as I have been known to do during his days of running cross country. No response, and none was expected. After that, we left the base for some breakfast. Returned to the base at 9:00, where we signed in and then made our way over to the All Weather Training Facility. It is here that the Commanding Officer recounts the training that the recruits experienced, explains the rules and responsibilities of liberty, introduces the Drill Instructors, and then performs the Liberty Ceremony. At the conclusion of the ceremony, the recruits are on liberty. A little chaotic, as parents, family, and friends seek out their recruits. We found our recruit and much laughing, crying, and hugging commenced. We spent the next 5-1/2 hours touring the base, having lunch with our recruit, and visiting MCX (think of it as the base's "Costco"). It was while walking the base with Number One Son that we learned of his orders. After his leave, he will report to Infantry School for 5-7 weeks. At the completion of that portion of his training, he will be heading directly to training for Embassy duty. It is difficult training, offered to only a handful of recruits based on their MOS, test scores, and demeanor/character. However if he passes, he will probably be assigned duty in Washington, DC. This is, from what we have been told, very good duty and allows him an opportunity for rapid promotion. 2:30 came way too quickly and we had to return him to the All Weather Training Facility so that he could report back to his platoon. At 7:00AM, we were back at the base to see the Morning Colors Ceremony. However, it was cancelled due to the weather (cold). So, we made our way to the Parade Deck for the Graduation Ceremony. And what a ceremony it is. While the Parris Island Marine Corps Band plays, the recruits march out onto the Parade Deck. It is an amazing sight - nearly 400 men marching in perfect time. As they turn, the sounds of 800 shoes clicking at the same moment is inspiring. I think that this was the first time I got emotional during the playing of the National Anthem. While I have seen a few graduations in my time, this was, by far, the best graduation ceremony. Nary a dry eye in the house. At the conclusion of the ceremony, parents, family, and friends rushed onto the Parade Deck to meet their Marines. More laughing, hugging, and crying. 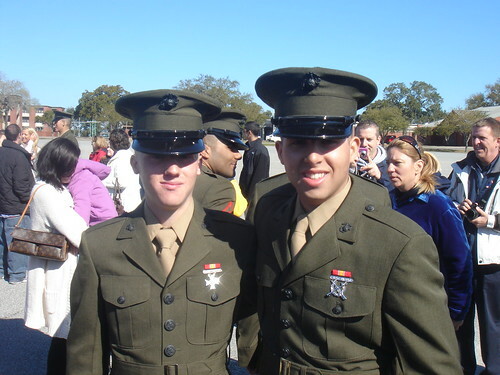 Private Eldred (left) and his friend, Private Rivera. Marines. The word "proud" is a good one, but one that doesn't do justice to the feelings that we have for Number One Son. Thank you, again, for your kind words, prayers, and letters. Number One Son kept every piece of mail that he received and was grateful for all of it. How about some humor? As you know, there are few items permitted to be sent to recruits. Packages are opened by the recruit, in full view of the entire platoon and Drill Instructors. One recruit's family must not have received the memo. On Valentine's Day, this particular recruit received a package from his girlfriend. Upon opening the package, he discovered that she sent him a pink teddy bear. The Drill Instructor in charge of discipline (the "kill hat," as he is referred) got his KA-BAR out, stuck it in the bear's belly, and ripped it up to it's neck. At that point he declared, "I am going to douse this is kerosene, tie a balloon to it's neck, and set it on fire. We can watch it burn as it flies out of sight. We are going to call this bear 'PJ'." Recruits are not allowed to laugh while in formation, so most started "coughing" into their sleeves. Number One Son said it was one of the funniest things he saw. On the way home, we stopped at Wendy's for lunch, with our Marine. What did he eat? A Triple Baconator, small fry, and a Mr. Pibb. Sweet and Spicy Asian Boneless Wings, small fry, and a lemonade. Congratulations to U.S. Marine Private Eldred and his proud parents. Congratulations to Number One Son, you and your family, Gregg. Let him know he's an inspiration and people he's never met are proud of him and thank him for his service to our country. Very cool man. Congrats to you and your son. Tell him Thank you from all of us. Land of the Free, BECAUSE of the Brave. I am overwhelmed by the response from all of you (and more). Thinking about how thankful you are for people like my son brings tears to my eyes. I can never repay the generosity you have shown to me and my family, especially Number One Son. When he told me that he was going to enlist, I was worried that there would be some sort of "stigma" attached to such a decision - from his friends, parents, and other adults. Nothing could be further from the truth. It is because of your actions that we were able to make it through 13 weeks without seeing him, talking to him, touching him. We are truly blessed to have a son as a Marine and you as friends. Thank You. Pardon me, while I go wipe my eyes. I like the bear in a balloon idea, but don't let my kids hear about it. Congrats on the Embassy duty, sounds good. Simply awesome. Thank you for sharing all the stories, Gregg. It let's us all be proud along with you! Congratulations to Private Eldred and to his parents as well, who obviously did a phenomenal job with the raising of their son. He's now a son of this whole nation and I personally thank him for his commitment and dedication. Semper Fi! Gregg, as I said when we've met over the past few months, you must be so proud of him. I can imagine being proud of my son in the same situation. So glad you got to see him and experience a little of what it's now going to take to feed him, although the US has that responsibility for a while, lol. Thanks so much for the report. This was the best experience I have had in a long long time. I am so proud of my nephew. Seeing this first hand will always be with me. Zachary IS an inspiration to us all. He represents the freedoms we all take for granted every single day of our lives. As Ronald Reagan once said "Some people live an entire lifetime and wonder if they have ever made a difference in the world, but the Marines don't have that problem. " That chokes me up every time....God Bless Zack and America! Grandpa and I are so very proud of our Grandson and what he has decide to do with his life. The whole weekend was very emotional and I still get tears in my eyes and how thankful we are for his decisionto enlist. He WILL be a very good MARINE. He is a Great Gandson and I'm having difficulty typing this We are so proud and Blessed to have a grandson like him. What a great story, Gregg. I can understand why it's difficult to even put into words how exactly you feel. I don't think I would've lasted 5 seconds with what was done to PJ. Wow, I must have missed this post! Congratulations to your son and you! Embassy duty is great. You will have to tell me the unit he ends up in, I have a lot of friends who are sill in the Corps and it would be interesting to see if he is stationed with them. Email addresses provided are not made available on this site. You can use UUB Code in your posts. This is a weblog with some basis in IBM/Lotus Notes & Domino software, when I feel like it or think of something that might be interesting. Other than that, we'll see where this goes. The views expressed in this blog are mine alone, and do not reflect the views of NextStep Technologies, LLC. If you think otherwise, you are mistaken. © 2003-2010 NextStep Technologies, LLC. All rights reserved. The rights to all logos, images, etc., are owned by their respective owners.